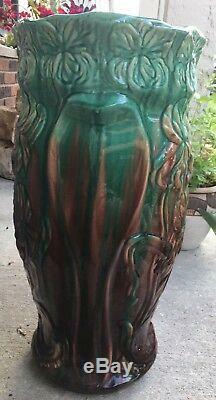 Wonderful vintage majolica style green brown umbrella stand or tall vase about 20 tall and top is about 9 diameter/across. 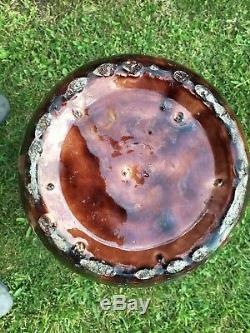 Some crackling splits in the glaze from when it was made? Normal usage marks from age. Really a great used vintage piece. 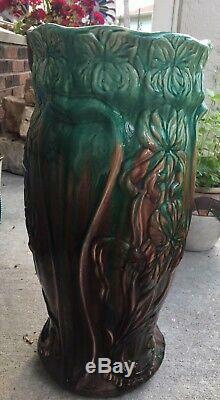 Im not sure but I think its by Owens Pottery or Roseville. 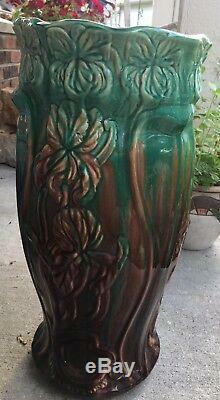 Majolica blended lotus/ lily design. I only accept Pay Pal payments. Pictures are part of my description. Thank you for stopping by. Come back often, I will be listing more of my treasures daily. The item "Vintage Art Noveau majolica umbrella stand vase Owens Pottery\Roseville Lily" is in sale since Saturday, January 5, 2019. 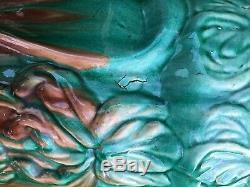 This item is in the category "Pottery & Glass\Pottery & China\Art Pottery\Majolica". 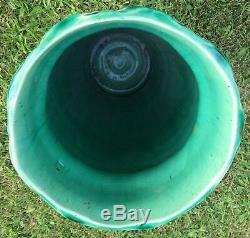 The seller is "flowersforever2010" and is located in Greenwood, Indiana. This item can be shipped to United States.